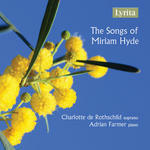 Camellia : a third collection of 11 songs for voice and piano / by Miriam Hyde. Festival flowers : for voice and piano / music by Miriam Hyde ; words by Valerie Barton. The words and music were written for the Song of Adelaide Competition, held 1968.